for the roof to fall." I must say that, having bought this book in a moment of lunacy a few years back, when, secured for stock at my former place of work by a seriously lovely and well-informed geeky book-type pseudo-named Bert, I took an illogical shine to the author's name, I was perturbed by the strong, almost hyperbolic, recommendations adorning the cover, with comparisons to Hemingway, and not one but two - count 'em, two! - bookends from some heavyweight literary chappies. This was nothing like that which I expected of someone whose middle initials were liaised bizarrely* and whose surname made me think of maple syrup. I was probably reading Charles Portis or something equally surreal at the time, and was in the mood for more. Hence, Breece has survived the move (I was still hoping for silliness) but had been gathering dust (it's short stories after all). Talk about astonishing**! I was astonished. There are two main reasons for this. One, I'd just rediscovered I Ain't Marching Anymore, a collection of folksy protest songs by Phil Ochs - video at the end - on my iPod, whose West Virginian roots I unearthed as a result of James Alan McPherson's introduction, along with Pancake's infatuation with him. Quelle coïncidence! Two, it's freaking awesome stuff. Dark, disturbing, ultimately human, Pancake's depiction of the West Virginia of his youth allows no sentimentality, but never condemns. His characters are uniformly lost, ultimately stranded in their own lives with only violence and longing as constant companions. A boy's only friend is a woman the town pillories as a whore; a woman loses her unborn child whilst secretly coveting her lost brother; a sailor rapes a runaway teenager because he doesn't know what else to do with her. Pancake doesn't play to the adoration of the crowd, only writing what he must, his characters taking centre stage and not his writing, which nonetheless almost fizzes and bubbles from his pen. It is a tragedy that he didn't live to write more, or that more of his work hasn't been collected and published posthumously. He has made me consider the way I write, being myself what I would probably decry as a clever clever writer, instead of a writer like Pancake who is clever because he doesn't feel the need to hog the limelight, letting his prose do the work. As one who we're told studiously re-wrote to get just the right phrase, le mot just, the right sound to his writing, I'm not surprised it reads so damned well and is quite so movingly brilliant. I am truly moved, no joke. So if you want to read something that is excellent in as many different meanings as you can think of, you can read one of these pretty damned amazing stories, The Honored Dead, over at BiblioKlept, where they "run short stories, poems, essays, and excerpts by various authors (mostly in the public domain, but sometimes not)." Not that I condone that sort of thing, but at least you can get a taste of some pretty great writers. For free. Otherwise, trip on over to The Book Depository and buy a copy. Hell, buy several and leave 'em on trains. I'm planning to do just that. Now, go check out some Phil Ochs. 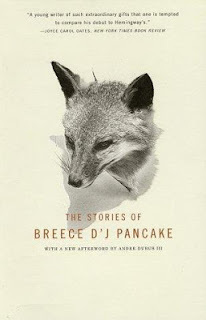 * A result of a typo by his first publishers, who instead of using a period, used an apostrophe, something which caught Pancake's fancy and which he decided to adopt officially. ** Regulars at the metaliterary feast table might expect sarcasm, but I'm pleased to say that his is said with all due respect to the author and his work.